As native Floridians, we grew up realizing that hurricanes and inclement summertime weather is inevitable. Marcy and I grew up in different parts of the state, Central/Southern Florida and North Florida respectively, and have lived through our fair share of rain, wind, and power outages. Although the mighty power of a hurricane is nothing to take lightly, there is some sense of excitement when battening down the hatches. However, as we saw with a tropical storm that passed through our neck of the woods this summer, cabin fever quickly ensues! As Floridian mommies now, we know that being stuck inside can be the best of times and the worst of times. 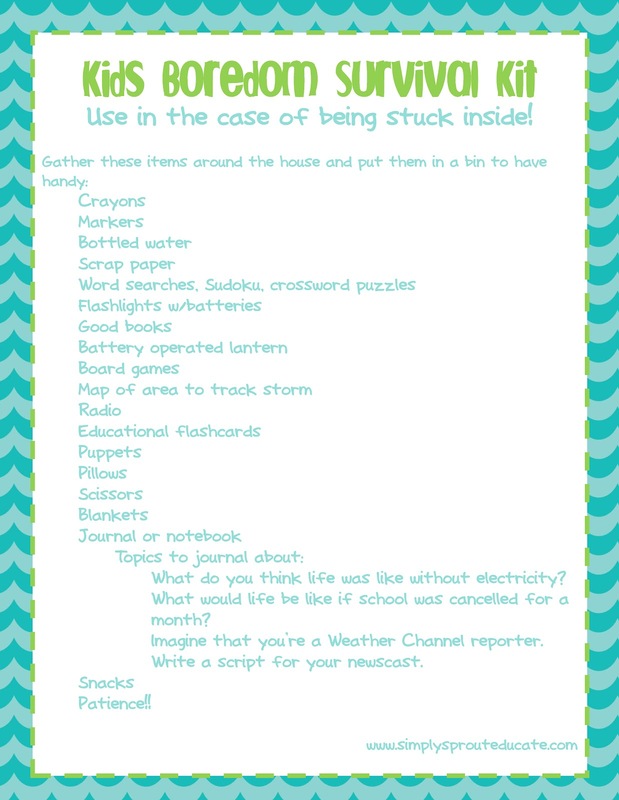 We've put together a kid "boredom survival" kit to help you make it through if you are a Sunshine State resident. If snow or other crazy weather patterns keep you cooped up throughout the year, keep the list handy! Obviously this does not take the place of a real hurricane survival list, and the importance of preparing a hurricane plan with your family. We pray for safety to all of those in our wonderful state and neighboring states, that Isaac comes and goes on his merry way!